During his lifetime and tenure as Apple CEO, Steve Jobs made a reputation for surprising the tech community with his product unveilings. While today was no different in some respects, Apple CEO Tim Cook's product demo may have been somewhat disappointing to many Apple consumers. A few weeks back many tech speculators had their own ideas about today's announcements. Few thought Apple would jump right to the iPhone 6, and they weren't disappointed. Two major products were announced; the iPhone 5C (C for Cheap or China, depending on who you ask), and iPhone 5s. The 5C is a cheaper iPhone product designed to go after the world's largest mobile network, estimated at 760 million users, in China. It differs from the iPhone 5 in many aesthetic ways, but offers few features above the current top model Apple phone. You can get iPhone 5c in an array of colors and the device comes natively designed to be more rugged. You can order iPhone 5c later this week (16GB $99 and 32GB $199 with a two year contract). 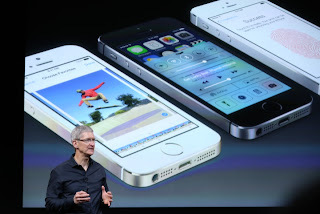 The iPhone 5s boasted over 200 new features, but only three were covered in depth during the conference. The biggest improvements for the 5s are the A7 and M7 CPU chips, making iPhone 5s the "first and only 64 bit Smartphone" , according to Apple's Phil Schiller. Apple also made several improvement to the built-in camera on the 5s such as; smarter flash technology for more natural looking photos, an auto stabilization mode that takes 3 photos at once and uses the sharpest parts of each for the final photo, and a better battery optimization. Finally, the fingerprint security feature of iPhone 5s is something consumers have waited eagerly for more a very long time. In addition to these new products, Apple will be rolling out OS 7 on September 18th, a free upgrade for devices that can use the robust new OS. You can visit http://techcrunch.com/2013/09/10/live-blog-from-apples-iphone-5s-announcement/ to check out more information on today's Apple product release.